Cook the noodles until they are soft. Then drain and put to one side. Boil the chicken stock in a large saucepan. Next add all the other ingredients and cooked the cooked noodles. Finally add 1 tablespoon of tomato puree then simmer covered with a lid on your pan for 20 to 30 minutes. This is a really great kids lunch time meal that is really tasty. It also has plenty of minerals and vitamins that a growing toddler needs. 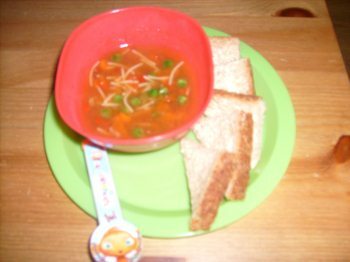 You can add a little bread and make this into a main meal if your toddler is not a big eater at the moment.